The valley in which Positano is located, with its beach, its steep limestone cliffs and its salubrious climate, witnessed the establishment of a sumptuous roman villa designed for “otium” – leisure time – at the end of the 1st century BC. As part of the Surrentum area (modern Sorrento), the villa was one of a number of luxury villas that had evolved on the Sorrentine peninsula by early Julio-Claudian times. 26 AD and members of the élite may have wished to be only a short boat-trip away from the imperial court. The complex at Positano featured a peristyle with, most probably, a central garden and a fountain. This was described in the late eighteenth century by the Swiss architect Karl Weber. There was a bath quarter, as evidenced by a room with terracotta pipes for radiant heating, as well as one lavishly-decorated room, most probably a triclinium. 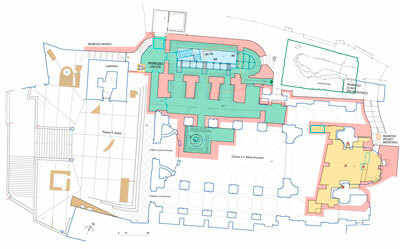 As with other Roman maritime villas, there may have been two or more levels. The academic Matteo della Corte also thought he had located the villa owned by Posides Claudi Caesaris, a powerful man who had been freed by the Emperor Claudius whose name may be linked to the town’s own name of Positano. After the disastrous AD 62 earthquake, the villa was undergoing renovations, probably also resulting from a change of ownership. 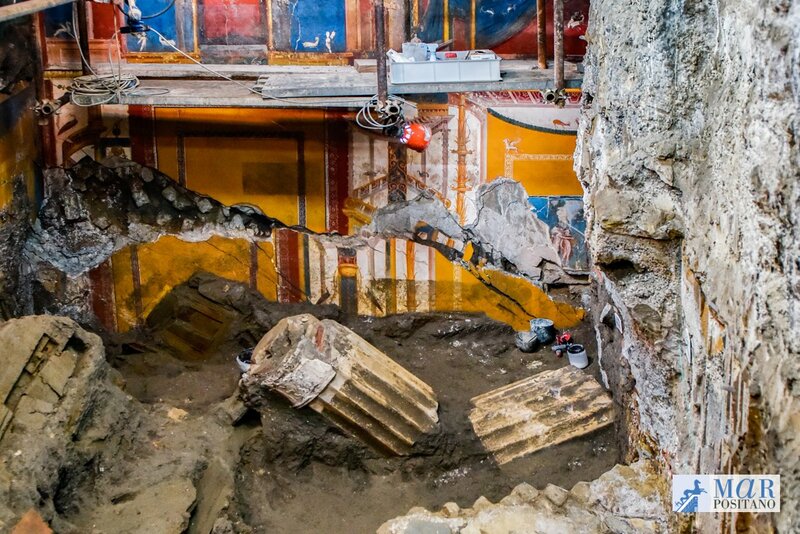 rooms, the sumptuous triclinium discovered under the crypt of the cathedral of Santa Maria Assunta. The walls of the room, covered with typical motifs of Fourth Style Pompeiian Wall Painting depict structures that are several storeys high. The buildings painted on the upper section of the walls are partially hidden by a trompe l’oeil curtain embellished with marine monsters, leaping dolphins and plaster cherubs.